Staff sold separately, but highly recommended! Oh, Anubis! If you've been feeling like the modern world is missing a little something, maybe it's time to think about bringing back the Egyptian gods. Sure, it's probably not your first thought you had about how to improve daily life, but roll with us for a second here. Egyptians had a pretty sweet deal going back in the day, and they had all kinds of long-lost technology and made some of the most important advancements in civilization. 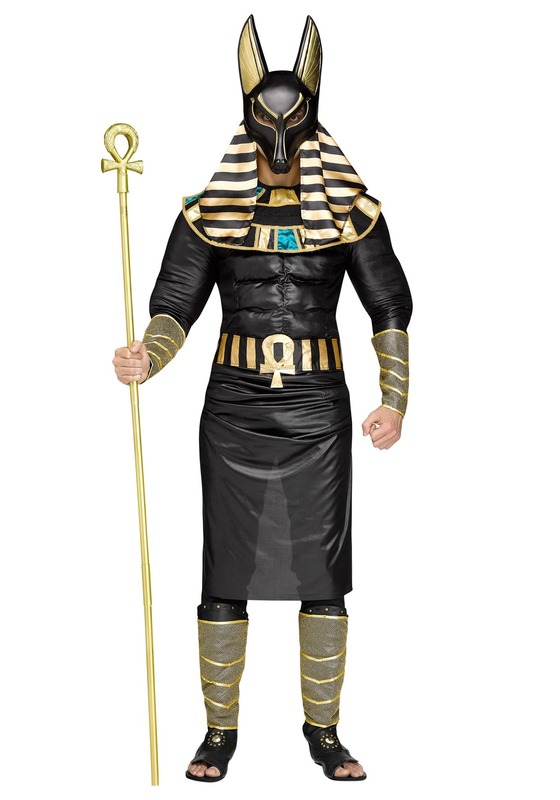 We think that 21st century folks might be able to learn a thing or two from the ancients, and what better way to start an Egyptian resurgence than with this adult Anubis costume! Okay, so maybe you don't have ulterior motives, and are just looking for a dark and powerful costume for Halloween. Or maybe you're looking for the perfect way to complement your lady costume partner as Cleopatra. Whatever reason you're inclined to think about Anubis, we're ready to tell ya, it's a great choice! The classic styling of this costume along with the seriously muscular jumpsuit will have you feeling like an deity worthy of worship! The all polyester shirt features fiberfill padding throughout the chest and shoulders to help beef you up. Wear the apron skirt over your own black pants and then accent the black with the gold arm and leg wraps. When you put on the elaborate headpiece, your transformation will be complete. An ornate fabric collar secures around your neck, and the headdress goes underneath the stoic dark mask. With those tall Anubis ears standing at attention, we're sure you're going to be attracting a lot of attention as this Egyptian god!